The four coloured pieces can be put together in two different ways to make these shapes with base 13 units and height 5 units. Why is there one square missing in the second arrangement? My main concern is that this references the shape as a right-triangle which neither is in actuality. I think this throws the students off a possible thinking path. If instead it referred to the shape less specifically, then students might more readily venture down this path. Good point David. The phrase 'right-angled triangles' has now been replaced with the word 'shapes' in the text above. Thanks very much for the suggestion. Was trying to plan a good lesson for ratio. As a substitute teacher, putting together an engaging lesson is paramount to avert discipline issues. So thought it just perfect, in keeping with the first step of arousing the interest of the class. Thank you. Could be used for introducing gradient. Cheating. The top triangle, measured as one unit has an area of 32.5. 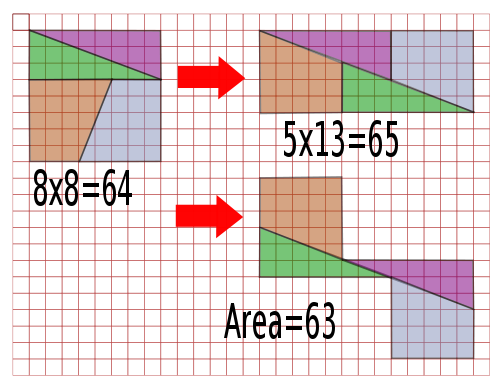 If we assume each cut up piece touches the grid, then we get get triangles of area: 12 (1/2* 8*3), 8, 7 and 5 (1/2 * 5*2) = 32. It doesn't matter what the bottom triangle looks like, the top triangle is lying to us and the bottom could be anything marginally different by not quite, but almost touching the grid lines anyway you'd like. Tricky. I like it becait tests our tacit assumption that the sub-shapes all touch the grid lines, when they don't. This starter has scored a mean of 3.4 out of 5 based on 371 votes. Sam Loyd presented this Chessboard Paradox at the American Chess congress in 1858. Notice the Fibonacci numbers which can be found in both of these diagrams. As you probably guessed, even though the red lines don't look parallel they actually are. Neither of the 13×5 triangles has the same total area as its supposed component parts. 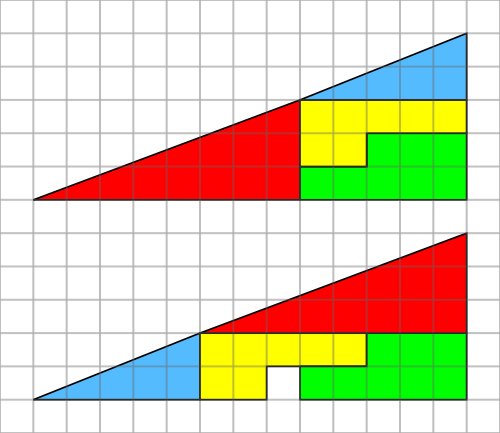 The four figures (the yellow, red, blue and green shapes) total 32 units of area, but the triangles are 13 wide and 5 tall, so it seems, that the area should be 32.5 units. But the blue triangle has a height to width ratio of 5:2, while the red triangle has the ratio 8:3, and these are not the same ratio. So the apparent combined hypotenuse in each figure is actually bent. Tick the Snap objects to grid and the display grid on screen boxes. Select from the dropdown box a spacing of 1cm. The red and blue right-angled triangles can be made using the "Right Triangle" tool which can be found in the Home tab, in the Drawing group. The green and yellow shapes can be created by putting together a number of 1cm by 1cm squares. Upon completion of the shape drag over the shape to select all of the squares then select "Group" from the Format tab, Arrange group. Turn the Snap To Grid option off an add custom animations to each of the shapes to make the first arrangement of shapes transform into the second. The images on this page are from the Wikimedia Commons. The descriptions of the licences can be found on the following pages: Missing Square Puzzle and Sam Lloyd Image.